WOW…we have SOOOO many things going on This Saturday! We hope are are ready for a real TREAT! First we have a our regular design team hop for you! 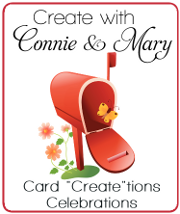 But instead of a SAB set (sniff, sniff…SAB is OVER) EACH design team member (except Connie) is sharing a card using ONE of the sets they are using for Create with Connie and Mary Card “Create”tions Celebrations! So you get a little ‘sneak peak’ of some of the sets we are using. 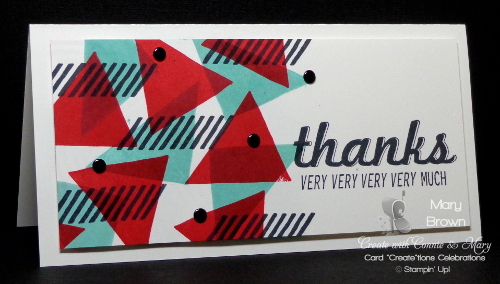 This is also the LAST day of Preview Week and that is why Connie’s is different…she is sharing a card set AND FREE TUTORIAL (along with some BLOG CANDY!!). See this Saturday is a real TREAT for you! 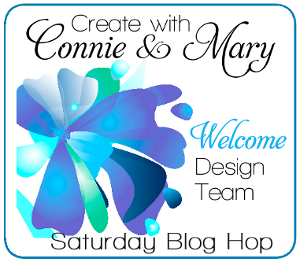 So if you are going forward through the hop…you arrived here from the Create with Connie and Mary site! Hope you left a comment for Connie AND downloaded the free tutorial from our public site. Stamp larger solid triangle using Coastal Cabana, other solid triangle using Real Red, slanty lines and greeting using Memento Black. Add Black Candy Dots to finish it off. featuring stamp sets in the Annual, Occasions and Online Catalogs,,,it starts TOMORROW!!!! This entry was posted in Clean and Simple (CAS), Create with Connie and Mary, Saturday Blog Hop and tagged Fabulous Four, What's Your Type. Bookmark the permalink. I love this colour combination, Mary! I haven’t bought this stamp set – but I like how you used it in your card (now I have to re-think…) 😉 Thanks for sharing! After I saw this card it too made me rethink because I do not use an abstract style . But Deb Smart is right- the way you used it was beautiful! Thanks!